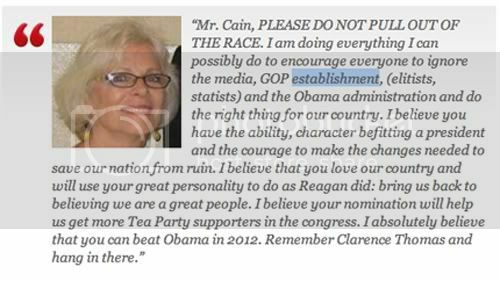 Herman Cain gave up the good fight but not without the support of what seems to be his favorite people--White women. We were trolling News One and discovered "Women For Cain," an online national fellowship of women dedicated to helping elect Herman Cain as the next President of the United States. Mr. Cain has been a strong advocate for women throughout his lifetime, defending and promoting the issues of quality health care, family, education, equality in the workplace and many other concerns so important to American women. Gloria Cain is the National Chairperson for "Women for Cain" and is the very special woman who Mr. Cain devoted his life to many years ago. Mr. Cain and Gloria celebrated their 43rd wedding anniversary earlier this year. The couple has two children and three grandchildren and a legacy of family, friends, and community and church involvement. "Women For Cain" was formed to inspire a national women's alliance in support of Herman Cain 2012 and Friends of Herman Cain. Please join our conversation to learn of volunteer opportunities and to be informed of issues and events surrounding the Herman Cain campaign. Thank you for your support. We welcome your thoughts and encouragement for Mr. Cain.